The Thirty Meter Telescope (TMT) will be the world’s most advanced and capable ground-based optical, near-infrared, and mid-infrared observatory. It will integrate the latest innovations in precisions control, segmented mirror design, and adaptive optics. At the heart of the telescope is the segmented mirror, made up of 492 individual segments. Precisely aligned, these segments will work as a single reflective surface of 30m diameter.The TMT project is an international partnership between Caltech, Universities of California, Canada, China, India and Japan. 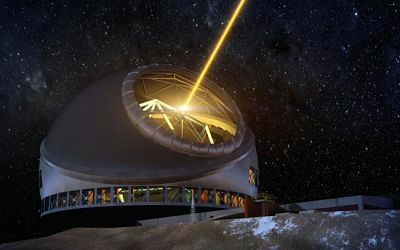 An artist concept of TMT at night, with the laser guide star system illuminated(Courtesy:www.tmt.org/gallery/photo-illustrations). Highlight the current status of TMT. Discuss specific science and technical work that is in progress. Initiate the formation of various groups of interested participants who can directly play a role in the various TMT-related activities in which the Indian institutes (ARIES, IIA, IUCAA) are involved. The first of the meeting series was held at ARIES, Nainital in November 2014. More are being planned to be held at other parts of the country. Astronomers and engineers working in institutes and universities in South India are encouraged to contact the SOC, if they are interested in knowing about TMT and contributing to it. A N Ramaprakash (Chair), IUCAA, Pune. Shashi Bhushan Pandey, ARIES, Nainital.